A five-month-old video of Gujarat's top Dalit face, Jignesh Mevani, "dug up" by a right-wing channel, finds Mevani, who won from the Vadgam with the direct support of Congress president Rahul Gandhi in the recent state assembly polls, controversially accusing sections of the Dalit movement as infected with Manuvaad and Brahminism, the terms used by Dalit ideologues to condemn casteism. "I do not believe that the Dalit movement cannot be Brahminical", Mevani said. Even as sharply criticizing what he called the "Brahminical attitude of some Ambedkarites in the Dalit movement", he continued, "There is Manuvad even within the Dalit movement, as well as Brahmanvad." Mevani used the strong words, significantly, before he allied with the Congress, or had even thought of fighting the polls with Congress support. He was speaking at an event in Lamakaan, an open cultural space in Hyderabad on Auguust 15, and the topic was the need for radical youth movements. He said this during a question-and-answer round with the audience. The video was dug out by the right-wing channel, apparently, to showcase how Mevani differed even with Dr BR Ambedkar, recognized as India's undisputed Dalit icon. While the main thrust of Mevani's interaction was to point towards how the Left and the Dalit movement were "natural allies", he suggested, he had the right to differ from Ambedkar. If, he said, Dr Ambedkar took a certain view on aligning with the Left, then "even my view can be different from his". If the views of Lenin and Marx couldn't be regarded as final, then this would also be true of Ambedkar or Periyar, he added: "This is what Ambedkar taught us." 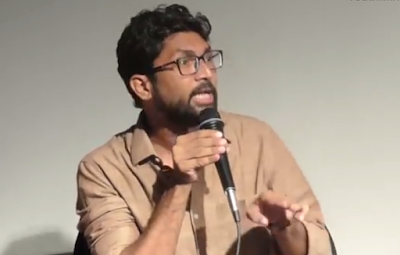 Criticising those in the Left and the Dalit movement who thought that the concepts of caste and class are opposed to each other, Mevani quoted top historian DD Kosambi as saying that classes arose in the form of caste, adding, in India, class and caste are intertwined and the struggle for class and caste must "happen at the same time." "How can someone say that the annihilation of caste can only happen after the class struggle, or vice-versa? ", Mevani wondered, adding, to believe that the Left has "never, in the history of India, tackled the issue of caste is historically wrong", one reason why those who followed Dr Ambedkar after after his death fought elections under "a combination of Dr Ambedkar’s Scheduled Caste Federation and the CPI." Asserting that Dr Ambedkar was at his "radical best" in 1930s, and in 1936, the Independent Labour Party he formed had a red flag, and he launched "many rallies with the communists", Mevani reminded Ambedkarites critical of the Left that Dr Ambedkar was no doubt critical of Marxism and communism, but also underlined, "The biggest enemies of Dalits and the working class are Brahmanvad and capitalism", wondering, "Why isn’t the Dalit movement saying this?" People do not remember this Ambedkar; they only remember the one associated with Buddhism. They do not remember Ambedkar who wanted to end Brahmanvad and Manuvad... They remember that he wrote the Indian Constitution, but not the Ambedkar who, four months before writing the Constitution, "wrote in 'States and Minorities', as a Left Wing politician would, that all the insurance sectors, land and key industries should be nationalised."